Cardiff Fire's Swedish defenceman Viktor Langseth. Pic: James Assinder. Cardiff Fire face a Severnside derby shootout when Bristol Pitbulls come to South Wales for a National Ice Hockey League clash at the Viola Arena on Sunday (6pm). The rivals are level on points, although Fire have four games in hand, and Pitbulls bring a team full of former Cardiff players, a fact which will add a major edge to what will be a fiercely contested, physical match. Head coach Mark Smith and his Fire players play two fixtures this weekend, travelling to face Romford Raiders on Saturday before welcoming Pitbulls to Cardiff Bay the next evening. Cardiff-born goalkeeper Ross Miller, a 23-year-old who played for Devils junior and NIHL teams before switching to Bristol a couple of years ago, is likely to one between the pipes for the visitors. Grant Richardson, the bother of Cardiff Devils- defenceman Mark and former Devils forward Lee is in the Bristol squad. The Rafaelli brothers, Giacomo and Giovanni, are both in the Pitbulls squad along with Australian-born David Manning, who was in the Fire team last season. Manning has played in Sweden, North America and represented Australia at junior level. Welshman Jordan Jefferies, 24, started playing in Cardiff and played for Devils at NIHL level before going to Bristol, while Jamie Newton, Steve Osman, Richard Hargreaves and Josh Galea are other Bristol players with Cardiff experience. The fact that so many Devils or Fire players are on Bristol’s roster will ensure will ensure plenty of hard-hitting in a match with plenty of personal pride on the line. 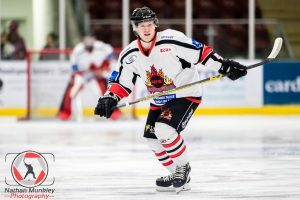 Fire include tough Swedish defenceman Viktor Langseth, aged 22, and Cameron Basnett, a 23-year-old smooth skating D-man who came to Cardiff after playing for Guildford Fire Kings. Saturday: Solent Devils v Peterborough Phantoms (5pm), Invicta v Lee Valley Lions (5.15pm), Romford Raiders v Cardiff Fire (5.15pm), Guildford v Oxford City Stars (5.30pm), Basingstoke Buffalo v Slough Jets (6.15pm). Cardiff-born Giovanni Raffaelli plays for Bristol Pitbulls.